One of the best parts of buying or collecting videogames physically is to look at their incredible box art covers. Very few can deny the satisfaction of holding the physical box or cart in their hands. Digital games are all well and good and there are some really great indie games as well. Unfortunately, some of them don’t get the luxury of having their own physical box to love and to hold. However, this doesn’t have to be an issue any more. With a few spare game cases and a computer, you can make up your own alternate Switch box art covers. Firstly, there are a number of box art covers or alternate box art covers readily available. The North American My Nintendo Website has some alternate box art as rewards. These rewards include: Splatoon 2: Octo Expansion, Octopath Traveller and Xenoblade Chronicles 2: Torna – The Golden Country. The Elder Scrolls: Skyrim and Wolfenstein II: The New Colossus alternate box art are also available online. Below are some links that will take you to the download pages of each alternate cover art. As regards to the My Nintendo website, some rewards are not available in certain regions. Aside from the official alternate Switch box art covers, some folks have even created their own unofficial box art to help fill out their collections. Media site Kotaku has rounded up a number of eShop title box arts that you can download the images of. However, it is recommended that you convert them into PDF files so that they don’t lose further quality or size ratio. We shall explain how to do this in a moment. 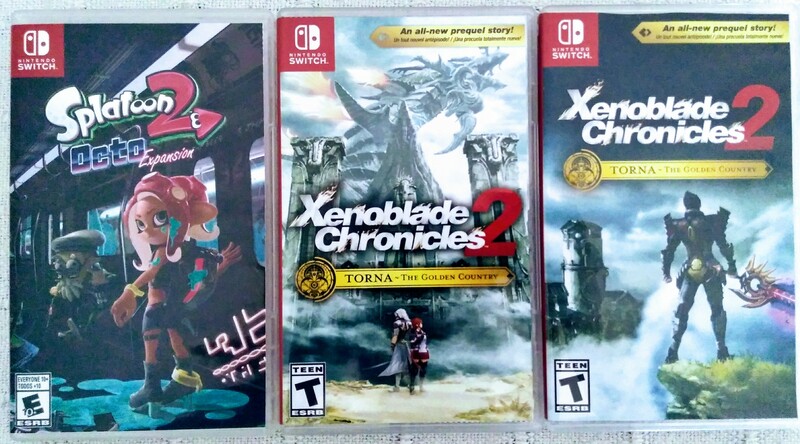 If you are feeling adventurous, you can make up your own cover art for your Switch game cases. We have a few helpful tips you may find useful. Bear in mind that there are probably easier ways to do create and print your own box art. We used Photoscape for editing and Microsoft WORD 2016 for the final touches. The Nintendo Switch box art cover is 208mm wide by 161mm high (1572 x 1218 in pixels). It is better to make the image bigger to start with and then shrink it down to fit the actual size. Maintain the ratio, as to avoid unnecessary stretching of the image. The spine is between 9mm and 10mm wide. The Switch Logo box is 22 x 22mm and the logo itself is 16 x 16mm. On Microsoft WORD, change page format to Landscape. Use Insert Picture to add your box art image to the page. If not already, resize your image to 208mm wide X 161mm high. Change the image’s property so that text can flow through the image. This gives you freedom to move the image. Position your image so that it fits center to page, NOT margin. If you have an internal artwork you want to add, follow all previous steps except steps 4 to 6, unless you want to. Centering both artworks to Center of Page and that the distance on all sides of the image are the same leaves minimal error for artwork o misalign from each other, back to front. Print your artwork with a good quality printer and on 80lb glossy brochure paper for best results. Alternatively, take your artwork to a professional printers shop and get them to print it for you. This is just one way to make your own alternate Switch box art covers. Whether you choose to download the official alternate art or create your own is up to you. If you do decide to make your own using our guide, be sure to tag us on Twitter with @miketendo64 and the hashtag #SwitchBoxArt. We may even follow up this guide with a gallery of your own creations. Thanks! I’ll be sure to add the link for the template in the article.